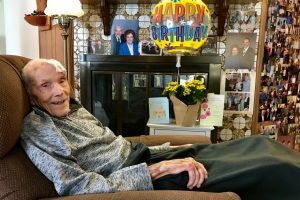 KETTERING, Ohio (BP) — At age 100, with some memories fading, Walter Davis still remembers the 1962 phone call he received from then-Southern Baptist Convention President Herschel Hobbs to ask if Davis would serve on a committee to revise the Baptist Faith and Message. “It was an honor to serve on the committee,” Davis told Baptist Press with help from his son Greg. Like Hobbs, Davis affirmed biblical inerrancy, yet he recalled that the committee “made a concerted effort to write the document in such a way as to avoid controversy between the conservative and moderate wings of the convention,” according to an email from Greg Davis. In 1961, Midwestern Baptist Theological Seminary professor Ralph Elliott published “The Message of Genesis,” a book questioning the historical accuracy of some stories in Genesis. Many Southern Baptists objected to Elliott’s views. Southern Seminary professor Dale Moody also “rocked the SBC” in the early 1960s by seeming to teach believers could lose their salvation. Both professors were viewed as symptomatic of increasing theological progressivism in SBC seminaries, Smith wrote. Among noteworthy phrases employed in the 1963 BF&M, Davis played a role in discussing whether the phrase “truth, without any mixture of error” should be carried over from the 1925 BF&M to describe the Bible, Greg Davis said. The phrase was retained. Gaines, pastor of Bellevue Baptist Church in Cordova, Tenn., commended the 1963 committee by recalling the challenging circumstances they faced. Hobbs was “an avowed inerrantist,” yet “he was a strong advocate of ‘unity in diversity.’ He wanted the 1963 BF&M to be inclusive enough for all Southern Baptists,” Gaines said in an email. More than 50 years after the 1963 BF&M was adopted, Greg Davis is grateful a “prototypical Southern Baptist pastor” like his father had an opportunity to shape a historic Baptist confession of faith. “May God use &#91;my father’s&#93; story to inspire someone, to try to challenge someone and help us all to realize that those who have come before us have paved the way for where we are today,” Greg Davis said.